Back in the 2011, when everybody seemed to give up on waiting for something from the Man – Mr. Garson had released an album of piano variations on various songs of his beloved collegue. It was well-received among jazz and classical music aficionados but went mostly undetected by the masses. Strangely enough – it just slipped through the cracks of public attention. It’s unbelievable how things get lost in the racket and clamor of information age. And that’s a great shame – because it’s a living, breathing creature disguised as an album – it shows semi-describable passion and brings you the rare feeling of intimacy with its sounds. It stuns with its presence. To quote Mr. Bowie “Whatever Mike lends his hands to invariably becomes something magical.”. But it began not as an album of solo piano variations. Years before the recording started Mike Garson was considering doing more traditional full jazz band treatment of his favourite songs – as he said in the interview: “I was thinking of doing covers with a lot of great singers I worked with, and that didn’t fly for me” (funnily enough – something similar happened to the James Williamson’s attempt to rejuvenate old and inadequately recorded Stooges songs on “Re-Licked“). 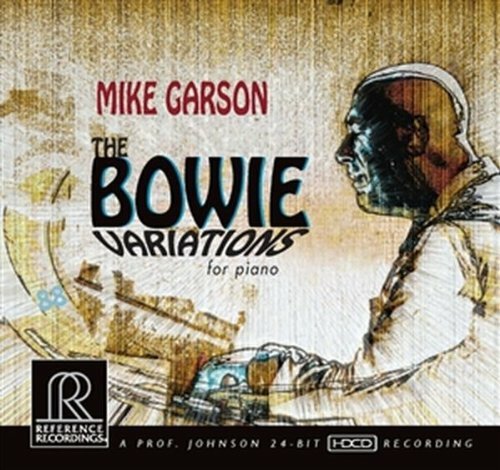 And so years passed in thinking the thing over and over again until one day Jerome Soligny (who wrote a book about David Bowie and it was titled “David Bowie”) had suggested that the most obvious thing Mr. Garson must do is playing the songs in solo piano style. Which obviously was too simple to be seriously thought about. But indeed it was the best way to do it. And then came Reference Recordings label with whom Garson had frequently worked with and the spark came and the work started. One of the first things that gets into your attention is how different a performance is in comparison of Garson’s more familiar in-band style. It is very smooth, sometimes melancholic, sometimes choleric, but always eyes rolled up to the left and tongue slipping over the teeth – thinking about the next step and then doing the completely opposite thing. For listener – it is far more challenging. Imagine yourself tripping merrily, then running off the edge of the cliff, running quite a distance and then finally looking down realizing where you are. In other words – it is utmost adventuruos. To quote Tony Visconti “Mike Garson listens attentively, then plays whatever the hell he wants”. You’ve been warned. The albums starts and ends with a lustrous renditions of “Space Oddity” (another cover of which is unlawfully forgotten in the current buzz – i’m talking about Langley Schools Music Project cover). And at first it sounds mellow, just like “Mood Indigo” introduction inside Erik Satie’s mind. But then it moves into recognizable territory albeit sounding like Bill Evans sonic portrait with some touches of Mr. Monk. It has this weird “head far back and away but high in the air” feel that brings imaginary waves on and off the shore of forehead and then clouds are spitting lightnings – in a very soft and gentle way – only tickling the surface and then going nowhere. “Life on Mars” starts with an intro written by Mr. Garson himself. As he said in the aforementioned interview: “…the first two minutes of that, I make up my own piece, totally my own piece inspired by David’s song and then I go into the song.“. And it compliments the song in the best way possible. It feels like Gershwin – tender, delicate movement through sad scape. Then chuckling all over the sudden and then chucking the sheet away. There is something unwritten. It wonders through the listeners mind – looking for a place to rest. And then the tempo ups and sweeps and the hard rain hammers on until it ringing fills the rest of space. And it’s over – you have a moment to think a bit. “Heroes” is a different kind of fruit on an album. It’s not exactly and not only Bowie’s Heroes but also a little bit of Philip Glass’ rendition of the song (from the Symphony IV). So it’s a variantion on variation. With some cool jazzy twists. After a short lyrical introduction it breaks free and rushes in some weird and funny manner, like that famous rabbit. It goes through the dense spaces – morphing into the sprawling gust – sparking and flashing melodies until burning out and bursting into memory – playing forever after. “Ashes to ashes” feels like a natural continuation of the previous track. It is its polar opposite in terms of tone but it highlights how far and how deep you can take the song and vast can be the difference between the versions. That prepares the listerners for the “Variations on Changes”. Which had changed a lot. It starts chaotically – messing around here and there and then dropping off to start it all over again but only for a moment until we get an Ellington lyrical interlude. And then again – the melody but interrupted constantly with different playful strokes. “Let’s Dance” is another highly energetic number full of furious improvs around the recognizable bass-line. It’s actually the closest we get to the Mike Garson’s style from the Bowie’s albums. It starts off from the midsection and then jumps straight into the iconic bass-line. The bursts of insanely fiery improvs are mesmerizing. If “John I’m Only Dancing” lets your ears and eyes to dance – here we can witness (in our imagination) how Mr. Garsons hands are dancing on the keyboard. One hand, two hands, three hands. Incredible! And then in the end he goes full-on Joplin stomp – which makes you halt and say “Wow!”. The real gem of the album is medley comprised from songs “Battle for Britain”, “Loneliest Guy” and “Bring me the Disco King”. Some of its sections are mixed with Garsons own parts on the respective tracks and it’s quite interesting combination. While it’s something of a collage it feels like it was written that way. First he jumps into new sonic place, dances around a bit, doing these foolish things and then things go murky and he surfs on the soundwaves up and down. You feel – something important is going to happen – and it happens – the track breaks down into a confession. About anything you might think of and nothing in particular (you must make your own mind after all). And after several minutes of melancholic reflections – the listener is surrounded with sonic wall and “the Disco King” part starts and it’s magnificently captivating moment. You must hear it yourself to believe. The next track is “Tribute to David” – the only original composition on the album. As Garson said in the interview “Purely homage. A tribute to David. It was just my way of writing a piece for him that just came from my world, and that’s what came out. It was more the intention to write a beautiful piece that seemed to feel like him, from my viewpoint. Nothing else.” No comments. While there are lots of various tributes to mr. Bowie – good, bad and awkward. I think this album deserves a spotlight as an ultimate tribute to a friend. Excellent and thoughtful review and tribute.